I've been baking slight variations on this 2 kg miche weekly for a month or so and it's time to share. It's very good. So good that it's keeping me from moving on to my endless backlog of must-try formulae from books and TFL blogs. The objective here has been to bring the Maillard flavors normally confined to the crust (or the surface of a toasted slice), into and throughout the crumb of untoasted bread. Nothing new or earthshaking about the concept: David Snyder turned me on to it in his mention of adding toasted wheat germ to a miche at an SFBI class. And of course the Red Malt about which Mr. Brownman has been schooling us recently is a close cousin. Other significant influences here are Jeffrey Hamelman's Pain au Levain (process) and Phil's Tarlee Miche (levain building). The arc of my journey with this formula over the past month has been toward more sieving & milling silliness, higher hydration and bolder baking. 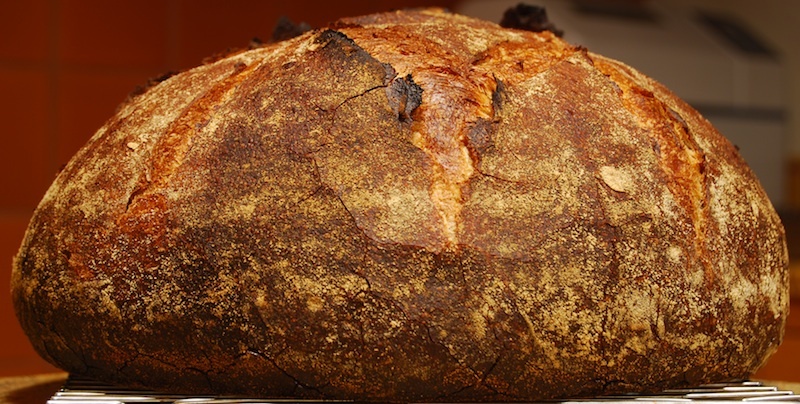 The crumb is cakey-soft at 70%, with very pronounced Maillard flavors and pleasingly mild levain tang. The crust in the bolder bakes has sung loudly (this past weekend, I thought it was hail on the skylight in the adjacent room) and has that delectably chewy je ne sais quois that boldly baked natural levain crusts provide. Click on the table below for a working (once downloaded as .xls) BBGA format spreadsheet with process. Levain building. My stiff levain thrives on its Gerard Rubaud feed so well that I tend to use it in the first build (which means the bread has fractional %-ages of spelt, rye + whole wheat -- although I confess I've taken to 50# sieving my Rubaud Mix -- somebody stop me!). In addition, I cold-retard the freshly mixed levain at each stage, straight to the fridge after kneading, for 12 to as much as 60 hrs before retrieving it to mature for 4-8 hrs @ 70-75˚F. My levain loves it when I do that for weekly refreshment, so I've indulged its preference for a chilly prelude at each stage. This stretches the process over more of the week, letting me feel like I'm doing some baking between weekends, even though it's just levain building. Toasting wheat germ and bran at least gives me a chance to turn on the oven M-F :-). I have not observed this early cold retard to sour the levain or final product the way retardation of levains or doughs that have partially or fully matured does. More sieving & milling nonsense experiments are in the works, but none except dab-inspired malt ideas start with whole grains. Plenty fun to be had with sieves & mill, and just store-bought flours, germ & bran. *slightly hacked KA grain mill for finer milling (and warranty voiding no doubt) than possible with stock unit. That miche is stupendous! The cracking in the crust caught my eye immediately ... I strive to get that kind of finish on a loaf! I have heard a lot of talk from bakers about the addition of wheat germ ... most of the wheat germ for sale in Australia is already stabilised so I am more than content to keep using freshly milled grains for flavour enhancement. tsk, tsk Tom ... what have you done to your KA mill? ... and need I remind you that sifting is a dirty, dirty habit ... flour will get everywhere. Crust development is certainly a welcome collateral benefit of my attempt to Maillardize the crumb. Crust flavor is intense. So far, bread appeal has trumped any milling & sieving detritus littering the kitchen island, as far as She-Who-Sees-Dirt-Where-I-Don't is concerned. But when I figure out how to lash the 50# sieve to one of my vibrating hand sanders (like I said: somebody stop me), the entire op will be exiled to garage or shop. Will share KA mill hack by PM. Have some (feeler guage) numbers on it that I've misplaced -- must be out in the shop. Stay tuned. Thanks again -- hope things are going well for you. Not much to study -- you've got your hands full I'm sure with milling from scratch, not to mention that wfo, lucky lady. While we certainly don't have a shop like Jarko blogged about this morning (where customers can mill-their-own), I've found that a local franchise breadshop is milling hard red spring wheat daily and will sell product fresh from the bowl. Outsourcing the heavy lifting thus offers me some nice options; experiments thus far are promising. Alas, SMB&SLT*. What a great experience and experiment. Your miche turned out beautiful inside and out but, unlike you, we like our little bits in bread :-) Retarding your levains, just like retarding fermenting dough, will increase the sour because at low temperatures the lab to yeast reproduction rate is 3 times higher than at room temperature. So if you build a levain to full strength at 10% hydration and then feed it additional flour to stiffen it up to 70% and then refrigerate it for a few days the longer it stays in the fridge you make 3 times more labs than yeast. So by the time you use the levain in dough you will have made more sour producing labs than yeast cells and inoculated your dough with a levain that has more sour producing labs in it. Same thing for retarding fermenting dough too. The longer it is at a low temps the more labs you produce to yeast. Yeast makes the proof and double in size and ready to bake. The fewer yeast cells the longer this takes and the longer it takes the more labs you produce at 36 F. This is also true at 90 F too . 3 time as many labs are being produced as yeast cells at high temps. So retarding the levain and fermenting dough at 36 F and then final proofing it at 90 F will give you the most sour. Thus the long 36 retard for txfarmer and dmsnyder's 85 F final proof. The best of both worlds. David has recently put this dough development together in his last San Joaquin bake but don't know if he has tried retarding the levain to go with this process. I don't like sifting but have done it more recently like yesterday for in some whole grain stollen using home milled soft white wheat. Now I know what I'm going to do with the extracted part. Toast it and put it back into something. I've got a a bag of germ in the freezer my apprentice always forgets to use and we will toast that too along with some oat bran that we don't know what to do with either. We will get this moved up to our next bake with some whole grains, sprouts, toasted stuff and malts. Thank you dab for such a generous tutorial. No offense toward your and Ian's predilection for 'bits'. Note that I qualified that above with "not in our table bread". In other breads, bring on the pistachios and lock washers. Easy on the Stabil glaze though. Your message confirms what I assure you I do understand as The Truth re: lab/yeast/temp/retard relations. I realize that I'm bucking dogma and logic by claiming these early retards aren't souring final products, but such has been my (or our -- my wife is rather more sensitive to [all flavors] sourness in bread than I am) experience with this series of bakes. Perhaps the uber-toastiness just overwhelms (balances?) the sour. Or I have a tin palate. I have sporadically suspended a pinch of levain in water and slid pH paper into the suspension. Thus far, the only pH drop observed is when a stiff levain is well past dome, idling in stationary phase*. There it drops from its max of 6.0 down to about 4.5. A t-giving week plan is to track the pH of the entire cycle of one of these extended fridge retards (since I don't have petri dishes with appropriate broth to count lab pops at home :-( -- would be fun, for sure). But I'm a toad, not a Wink. Thanks for the input Mr. B. *Haven't tracked my 100% levain stock thus. It's been grounded for weeks, patiently responding to weekly refreshments, without any cold retards -- that being only for stiff levains. But the 100% is on deck for dough service during t-giving week: I've been feeding a subculture of it with 50#-sieved Durum Atta for a shot at Altamura w/same. Nice baking and experiment Tom. I love the crumb texture you achieved and it must taste as good as it looks. Like Phil said that crust looks just amazing, or maybe I just said that :). Thanks for the comment, Ian. Crust tastes at least as good as it looks. Strong flavors -- something it seems you're not especially averse to in your ever more creative bakes.